It’s about two months until the sailing season here in the North East ends and the fall migration south begins for those who don’t haul in the fall. 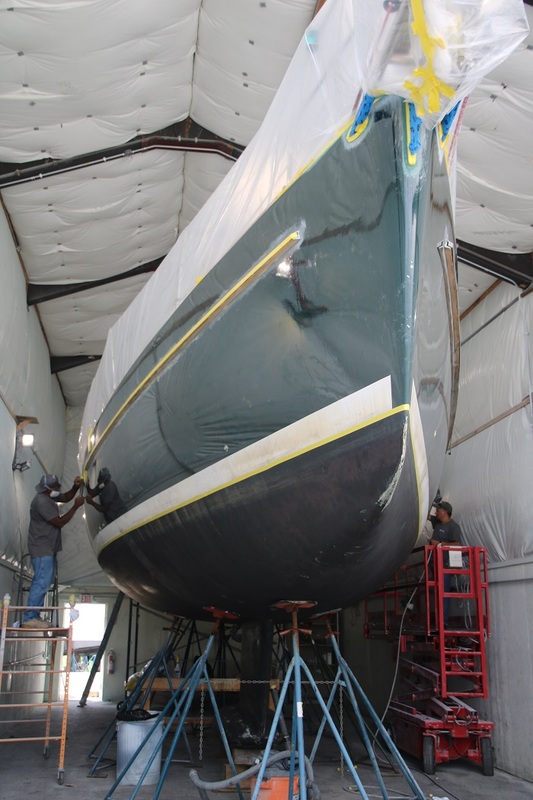 While most of the folks I know are out sailing around New England waters, Pandora’s in a shed being painted. I have written about Pandora’s new paint job for a while now and yesterday I went to take a look at her, all shiny and nearly ready to launch. I’d say that she’s really, really shiny although it’s a bit hard to see just how great she looks tucked inside a “small” shed. As I mentioned, it’s hard to see how perfect the job looks. This angle perhaps better, or not. I think that the stainless rub rail really sets the grey hull off. It’s certainly a lot different than her way-dark green hull of yore. The next step, beyond a million little things that they will do to clean up any “boogers” in the paint job, will be to have the logo applied. I loved the one done for “old Pandora” years ago and had the designer spruce it up a bit. That version was done by Accent Graphics in Annapolis years ago and they were happy to update it a bit for “new” Pandora. I think that they did a nice job. We will be going with black lettering and a metallic outline. The stars, probably black or even white. Not sure quite yet. A local shop will take the file, print it out and manage the installation on port and starboard quarters. The plan is also to put the logo, sans silver outline, on each side of Pandora’s boom as well. A few engine related items to handle including the standing rigging that needs to be ugh, replaced. Well nearly all of it needs to be replaced. The rigger picked up the rod last week and has taken time to inspect each piece. 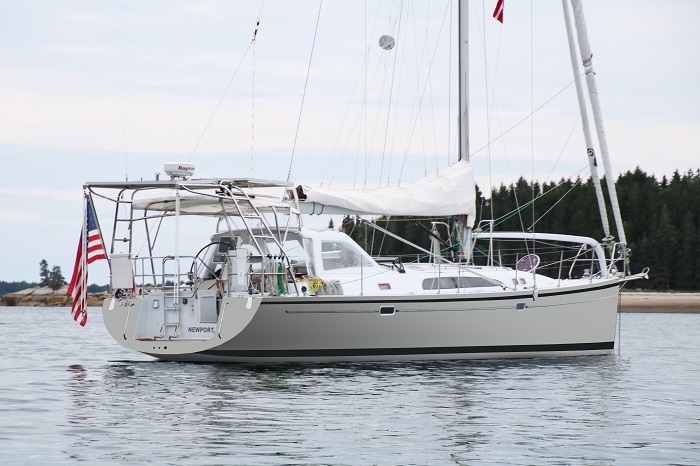 With 40,000 miles under her keel, it’s in not-so-great condition. This is a photo of a head on one of the main shrouds. I’m lucky that it didn’t come down already. See that small crack just under the head. Imagine that going all the way through and having the mast crash down in a heap. That’s the head for one of the main shrouds. The most important piece of the rig. Beyond bills to pay and it seems that they just keep getting bigger, there’s lots to do to get ready for our departure in late October but first I’ll have to finish the remodel job in our guest bath. Yes, dealing with the honey-do list is important. To fall short on that front, well, that would be a CLM (career limiting move), and we wouldn’t want that, would we? Well, they always say that owning a boat is just having a hole in the water into which you pour money. Unfortunately, with all the work done on Pandora this year, painting and pulling the rig, it seems that I have really “opened Pandora’s box”. Well, I guess that’s about it for now. Not happy but hey, she does look great. I guess that I’d better sign off for now and get moving on the guest bath. Yes, first things first. If you follow this blog you know that I am the Port Captain in Antigua for the Salty Dawg Fall Rally to the Caribbean this fall. The rally has a number of destinations and I will admit that I am biased about where you should make landfall. In particular, I think that you should make your destination Antigua. And, it’s all about what happens once you arrive. In spite of what some say, it’s not all about the journey and after an ocean run of over 1,000 miles, you will be ready for some R&R and have we got some great R&R in store for you. I have gotten a number of questions about what is planned for those who do the rally or join us in Antigua, so here goes. Some have also asked me if they could join in with the fun even if they don’t do the rally and the answer is YES! We’d hope that you would decide to join the Salty Dawg Sailing Association but that’s up to you, so come to the party. N0, make that “parties” as there are plenty of events coming your way in Antigua. Better yet, if you are one of the many Dawgs that have been down in Grenada or Trinidad for the summer, sail north to Antigua in November and join us. It’s not that far, really, and I promise we’ll make it worth the trip. 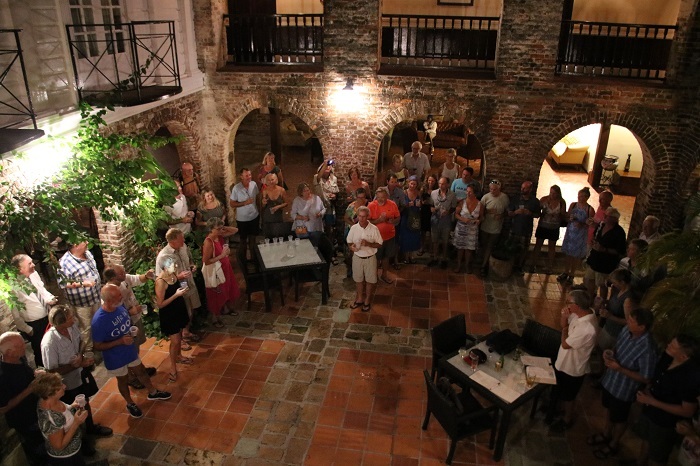 The arrival activities are slated to begin when the bulk of the boats in the rally arrive in Antigua so for planning purposes, they are slated to kick off on November 13th and run for nearly 10 days. The goal is to tap into the best of what Antigua has to offer and to do so in a way that won’t break the bank. So, with that in mind, we will be hosting a series of fun events to celebrate your arrival in Antigua, wherever you come from. It’s all centered on Nelson’s dockyard, arguably the most spectacular destination in the Caribbean. I am working with the National Parks commissioner to arrange for discounted dockage, probably somewhere in the $.50US/ft/day, a bargain in a spot as beautiful as this. Nelson’s Dockyard: The plan is for all “Dawgs” to tie up along the dock for a week of fun. 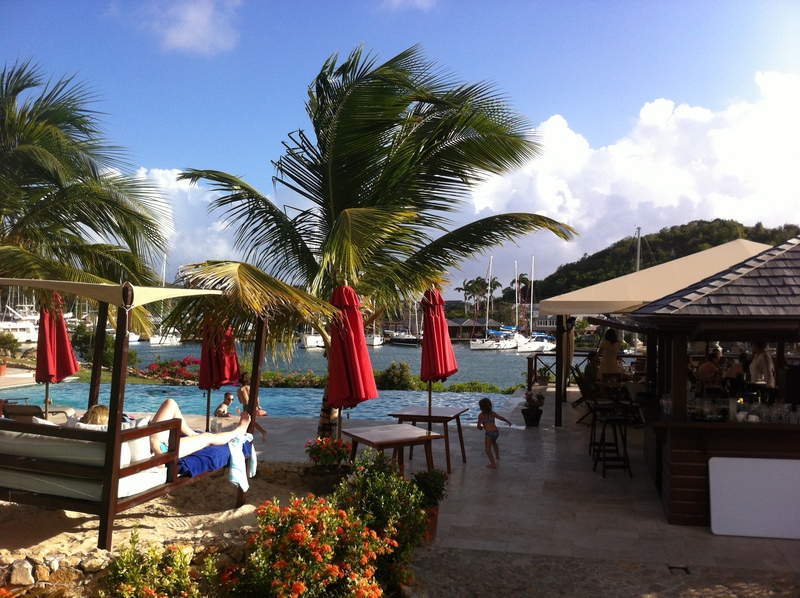 This historic dockyard is one of the most beautiful and well-protected harbors in the Caribbean. Nelson’s Dockyard, the only operating Georgian Dockyard in the world, was once home to the British Royal Navy. You will be in the heart of the Salty Dawg Arrival activities when you join the fleet here. 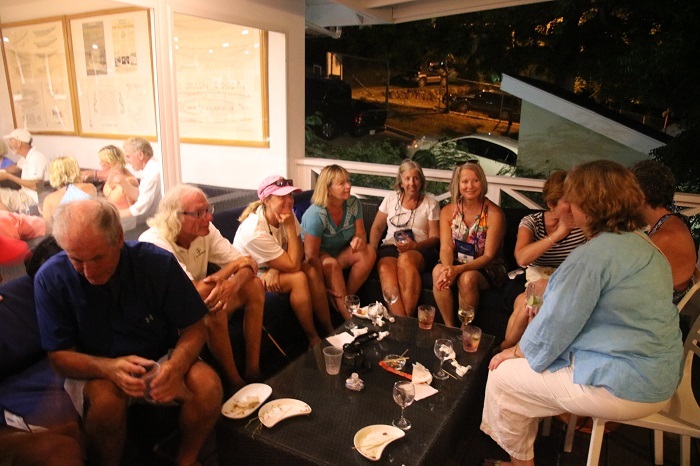 Antigua Sailing Center Happy Hour: Overlooking beautiful Falmouth Harbor, the sailing center is active for local sailors. Join us for drinks and appetizers at special happy hour prices. $5 US payable at the door and cash bar. 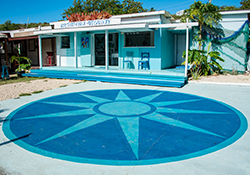 Rhum, Reggae and Art: Join us for an evening of fun to celebrate the season opening of Rhythm of Blue Art Gallery, located between Falmouth and English Harbor. 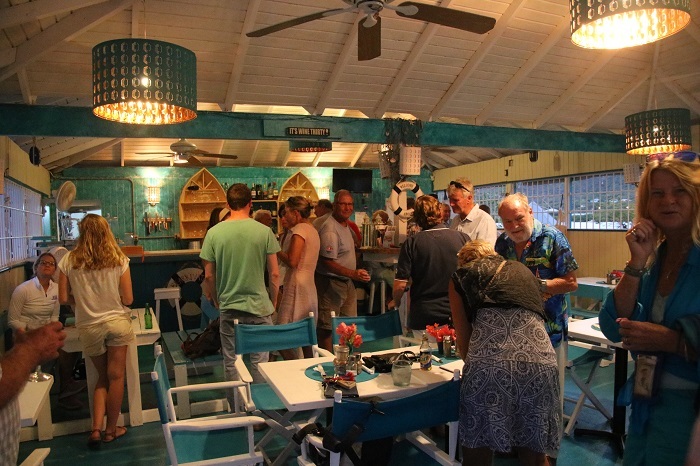 There will be a local Reggae band on hand to set the mood along with complimentary light snacks, rum drinks as well as beer and wine for sale at very reasonable “happy hour” prices. Who knows, you might win a prize. The Royal Navy Tot Club of Antigua and Barbuda: An evening with this group was one of our most popular events last fall. The “Tot Club” grows out of the discontinued tradition of issuing a “tot” of rum to all officers and seamen in the Royal Navy. Learn about local British navy history and raise a glass with fellow Dawgs and Tot Club members all for $3 US, such a deal, payable at the door. 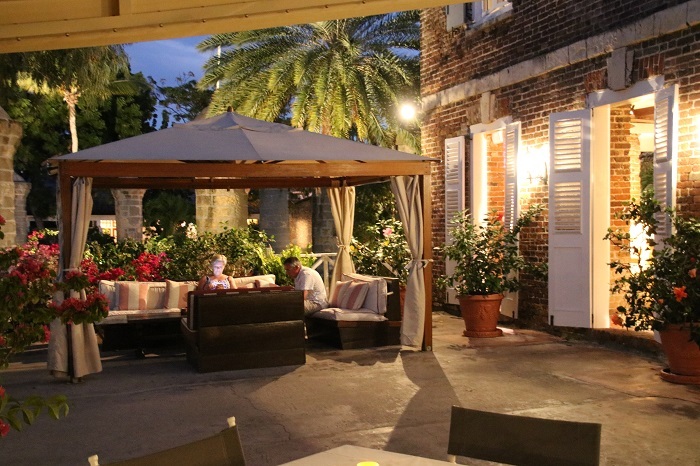 Includes a “tot” of fine rum in a fabulous historic location. Drinks at happy hour prices are also available. 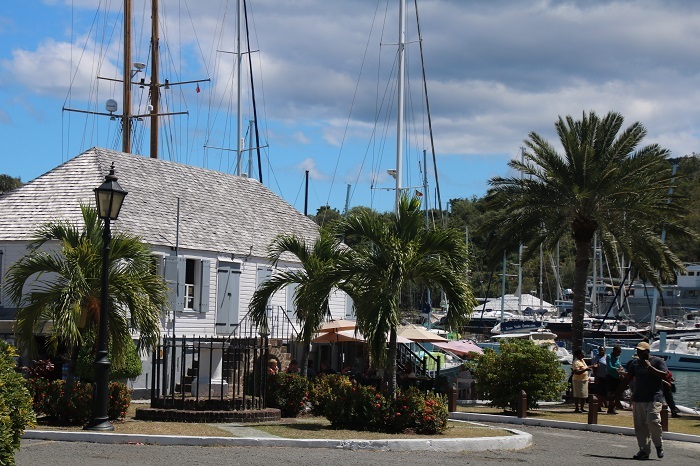 Fleet Welcome Happy Hour at Admiral’s Inn: This venue, in the heart of Nelson’s dockyard, is arguably the most scenic venue in the area. Our fleet will be treated to drinks at happy hour drink prices as well as supplied light hors d’oeurves. $10 cover charge, per person, payable at the door. It’s a spectacular venue. Our arriving skippers and crew last fall. 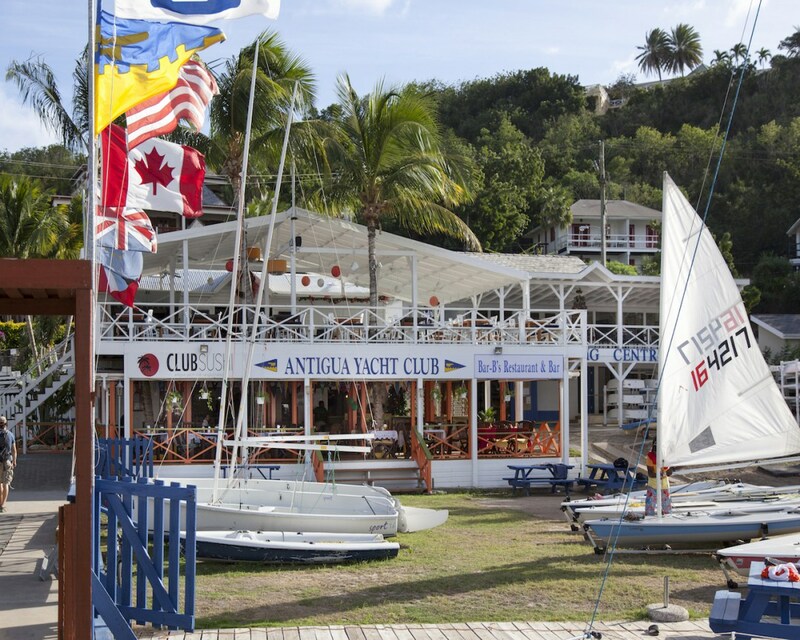 Antigua Yacht Club Member/Guest Welcome Reception: Enjoy appetizers and even a welcome rum drink, compliments of the Yacht Club. This event is a must as we meet local members of this wonderful club overlooking beautiful Falmouth Harbor. 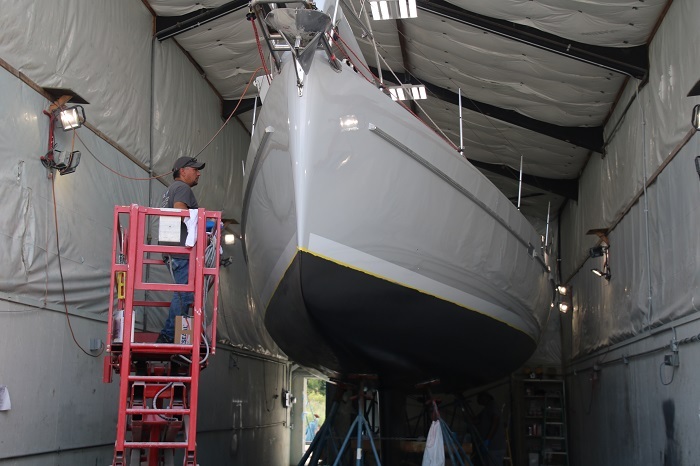 Government dignitaries will be invited as well as members of the Marine Trades Association so you can meet businesses that can solve any problems you might have with your boat. Cash bar. North Sails Open House at the Loft: Complimentary beer, wine and snacks at the North Sails Loft, English Harbor along with fun door prizes. You can’t beat free! 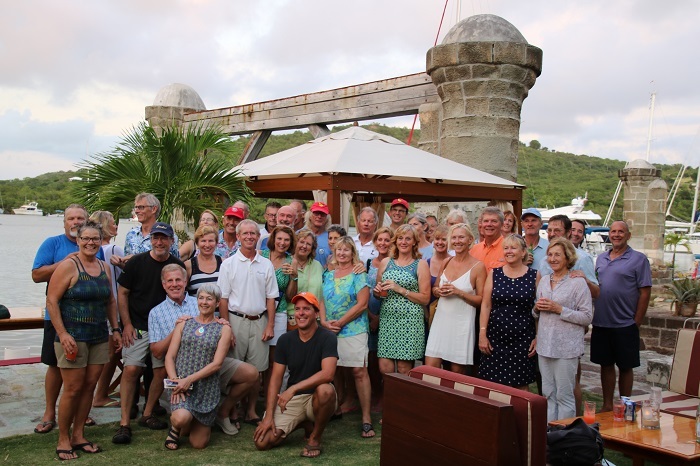 Thanksgiving Dinner at the Antigua Yacht Club: To be held at the Antigua Yacht Club and managed by Angie in “the Clubhouse.” This event with a popular local band will carry a modest fee and will also be open to all Antigua Yacht Club members. And, if you and your crew need some shore-time, the Admiral’s Inn is offering rooms for arriving crew and skippers at very attractive “dawg rates” starting at around $150 per night. Contact The Admiral’s Inn for more information. Mention that you are with SDSA for these rates. And, of course, on the “off nights” there will be informal pot luck dinners and cocktails behind our boats in Nelson’s Dockyard. Finally, can’t decide where you want to cruise this winter? 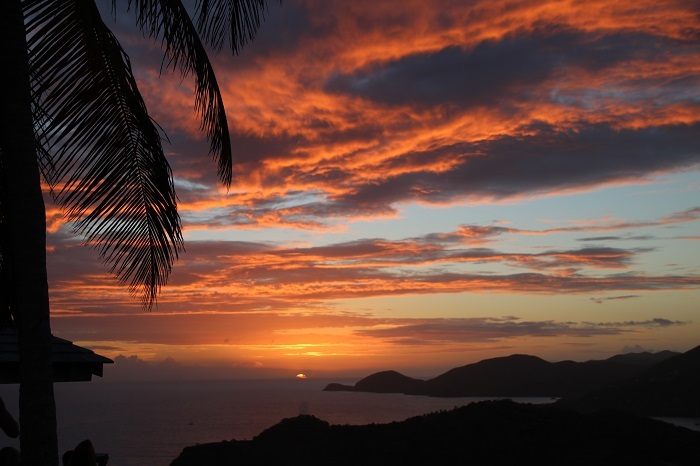 Antigua is ideally situated for cruising farther south as well as making your way, on a civilized broad reach of course, toward the Virgins, Puerto Rico and the Bahamas later in the season. Oh yeah, one more thing. 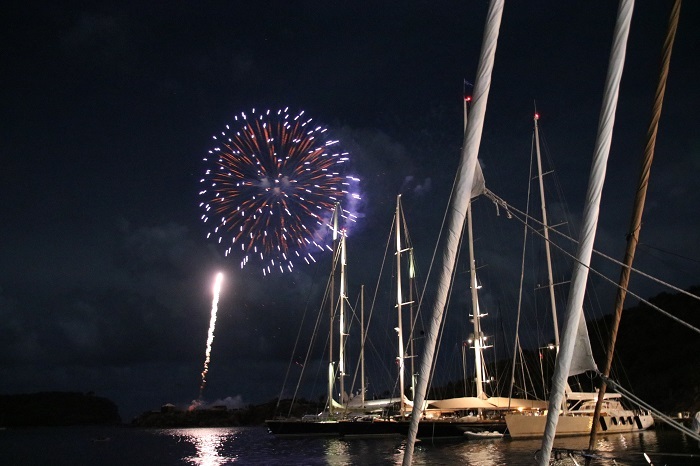 If you hang out in Antigua for New Year’s Eve, you’ll see spectacular fireworks in the Dockyard. It’s not to be missed. But best of all, all season long, you’ll see sunsets like this. So, there you have it and there’s lots in store when you join us in Antigua. I have written lately about the of choosing a color for Pandora’s new paint job and it has turned out to be quite the process. Most owners and certainly builders, trying to keep it simple, just say “paint it white” and it seems that even that can be complicated. White isn’t always white. Awlgrip has about 25 colors that can loosely be described as “white” and that doesn’t even get into the colors that stray into the greys and tans. White is so pervasive among boats that the line of Island Packet cruising boats and their distinctive tan (Or is it biscuit?) off-white always stand out in a harbor. So, here I am complicating things further painting Pandora grey. My biggest concern has been that if I go too light there would not be enough contrast with the cabin and deck and she’s look like a marshmallow and if too dark she’d look like a micro-battle ship. One comment on my blog suggested “Bob, just pick a color that’s the same as bird poop”. Thanks Mary-Marie, that helps a lot. The yard, Cooley Marine in Stratford CT, that’s handling the refit was recommended by one of the managers at the yard where I normally haul Pandora each year for work. The owner, Andrew Cooley has been very helpful in assisting me with color selection and somehow took a photo of Pandora and overlaid various color options which I chronicled in nauseating detail, in case you missed it, in this post. He has two facilities, one in Stratford CT at the Brewer’s yard and another in Stamford at the Hinkley yard. I understand that Hinkley has a terrific paint shed but the yard fees were a bit too rich for my blood (There’s a reason that Hinkley describes their boats as having “million dollar paint jobs”) so we settled on the Stratford yard. 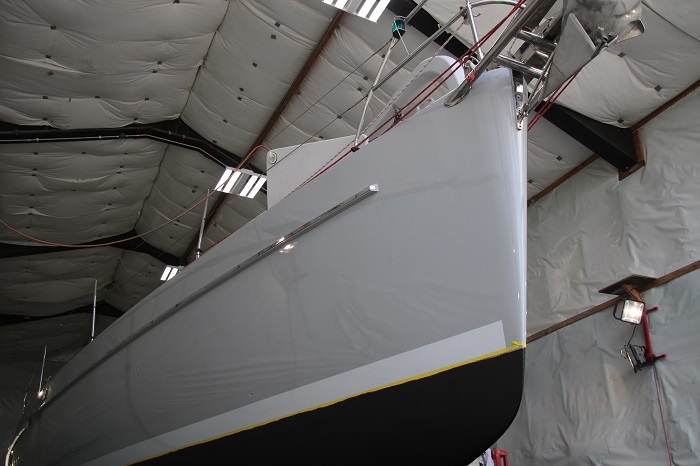 Cooley has done some big as well as little jobs and handles complex refits as well as straight up paint work. Pandora’s job was a bit complicated because of a wooden rub rail that protects the hull. 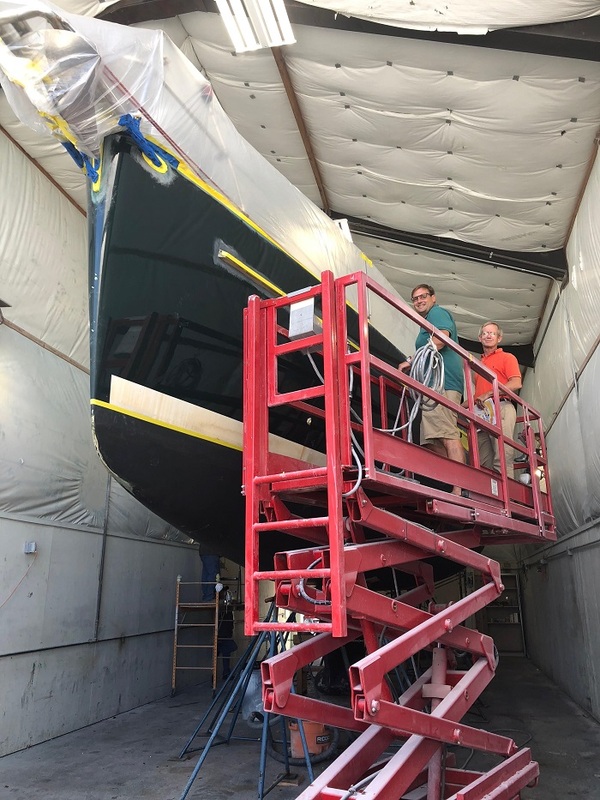 Unfortunately, it was never properly prepared when the boat was built and therefore it has had a habit of peeling badly over the years. Cooley has taken some special preparation steps that we hope will minimize the problem going forward but only time will tell. This is me and Andrew checking out the “bad news” regarding the toe-rail before she was prepped for paint. Notice that his smile is bigger than mine? Just why is that, exactly? 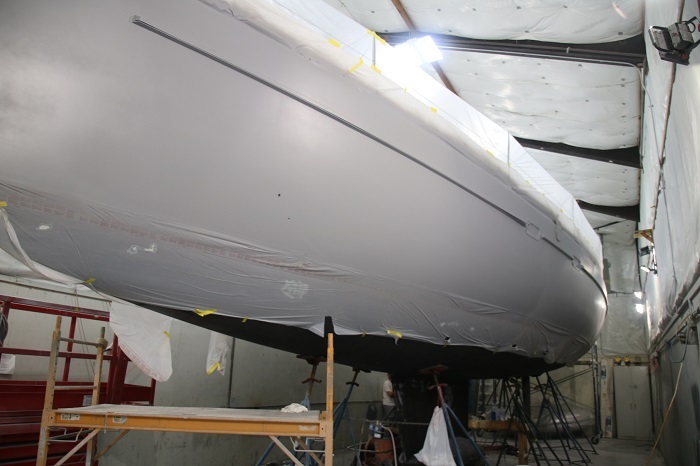 We settled on Alexseal paint, as I have mentioned in past posts as it’s easier to repair and with all the distance I cover with Pandora, things do go “bump in the night” so repairs are inevitable. The Princess and the Pea, that we hope isn’t too light or two dark. This is what the mockup of Pandora is like with that color. However, I expect that it will look a bit darker, or will it be lighter, when it’s all done? Who knows. I visited her in the shop the other day after she was primed, a sort of, light grey. Yep, looks a little like a micro-battle ship. So, what will Light Grey really look like , really? I have only the vaguest idea when you come right down to it. 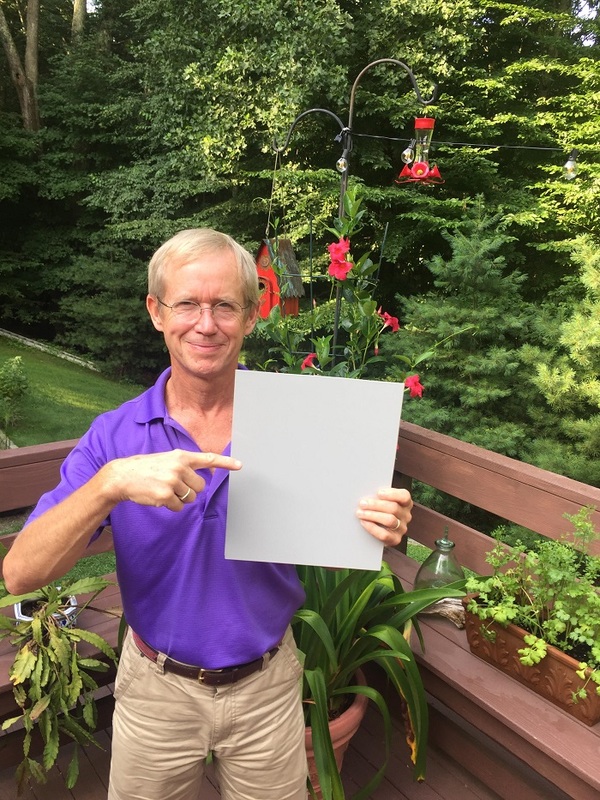 Or, to put it another way, she may look a lot like this 18″ square piece of aluminium that the yard painted Light Grey. That, of course, would be if she was 18″ long and happened to have the woods, red flowers and hummingbird feeders as a backdrop. Confused? Me too. But wait. When all is said and done, I expect that this whole “choose a color” exercise will be a bit like choosing perfume. After the first 3 or 4, they all start to smell the same anyway so just pick one and be done with it. One way or the other, it’s all about the execution and I am sure that she will look just smashing when she comes out of the shop. No wait, smashing?, not the best choice of words. No, I am sure that she will look beautiful in her new colors. Before I break, here’s another idea. 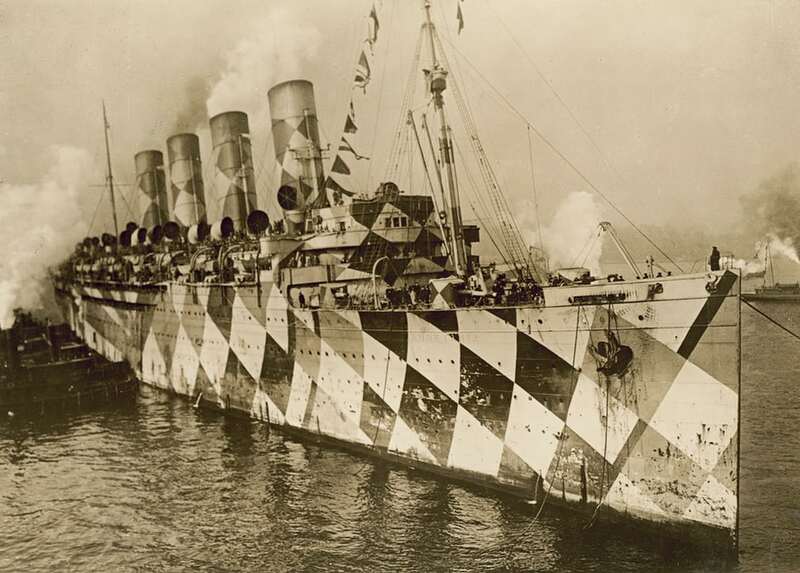 How about drawing inspiration from the Navy in WWI when the British artist Norman Wilkinson, came up with the idea of painting ships with a mix of geometric patterns to make it more difficult for German U boats to get a good bearing and distance. 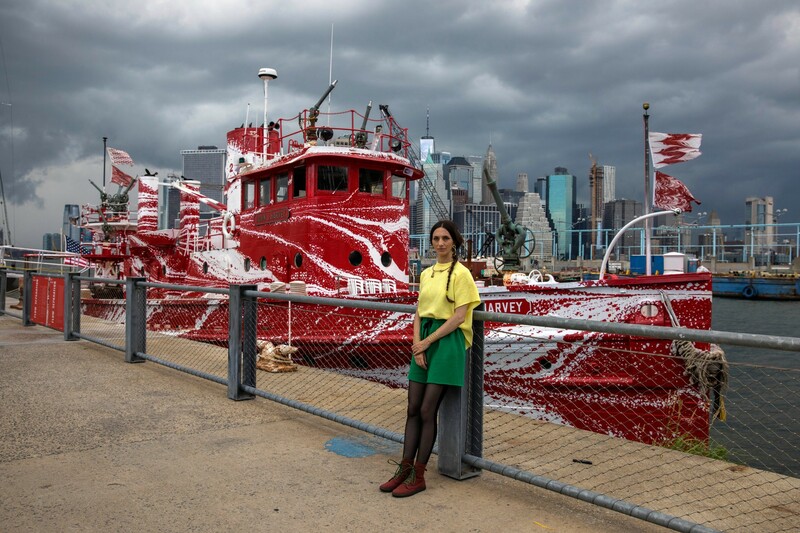 Besides, it’s a timely question as a nod to the 100th anniversary of the end of WWI this November, an artist, as reported in the NY Times, has painted the now retired NYC fireboat, the John J. Harvey in a modified “dazzle” paint job. Actually, it’s a very interesting article. Check it out here. Oh, never mind. I’ll just stick with grey. Whatever the color, I am sure that she will come out of the shed in a few weeks, ready to dazzle.